Growing up, Judge Robert Beach ‘48 led a nomadic life with his mother, living all over the West Coast in rooming houses, tents, apartments, and even their car. Perhaps it was his mother’s love of travel that inspired him to live an adventurous life when he’s not on the bench as one of Florida’s longest serving judges. At age 37, he quit smoking and took up swimming, becoming a highly regarded competitor in the Masters Swimming circuit. At the age of 50, he attempted a swim of the English Channel, and was just 2 miles away from reaching the French shore. 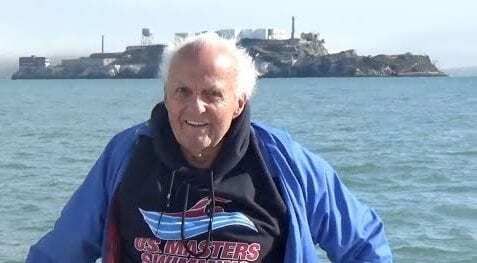 For his 87th birthday, Beach set a record for becoming the oldest swimmer to make the crossing from Alcatraz to San Francisco as well as the oldest swimmer to complete the Golden Gate Swim. His adventures aren’t limited to the aquatic variety, either. He has also climbed Mount Kilimanjaro, gone skydiving in Namibia, explored the ruins of Stonehenge, and seen the Leaning Tower of Pisa. Beach has never forgotten his alma mater, and every year, the staff at ANA look forward to receiving his annual holiday newsletter detailing his latest adventures. It leaves us all wondering, what will Judge Beach do next?